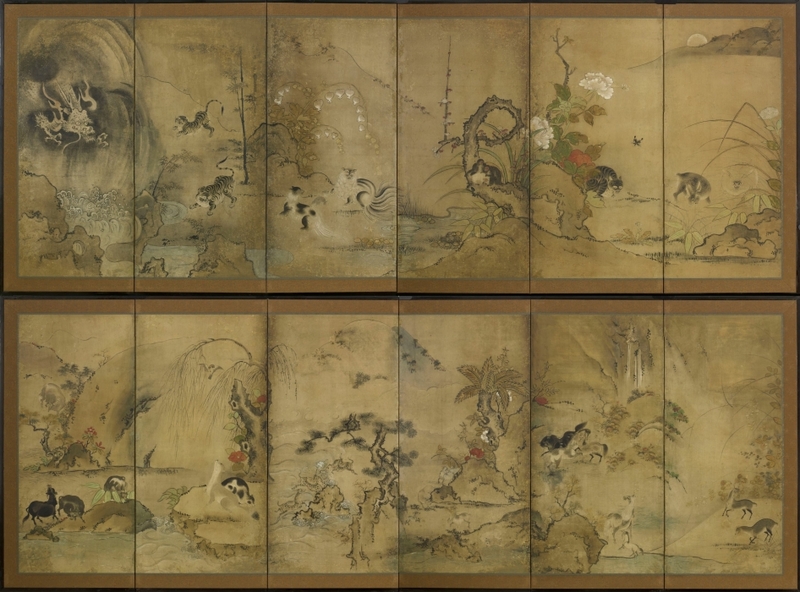 6855 A two-fold paper screen painted in ink and colour on a gold ground with chōchō (butterflies) and a family of kiji (pheasants) amongst susuki (Japanese pampas grass). In Chinese tradition pheasants are highly regarded as one of the Twelve Ornaments which were embroidered on the Emperor’s robes over 2,000 years ago and these birds have many positive connotations. The pheasant was also frequently used as a substitute in Chinese art for the Vermilion Bird as an emblem of the south, the sun, beauty and goodness. The kiji is native to Japan and is widely distributed around the country. It has long-been credited as being an official messenger in the ‘Age of the Gods’, the period prior to recorded history that is accounted for by myths of the country’s divine creation. 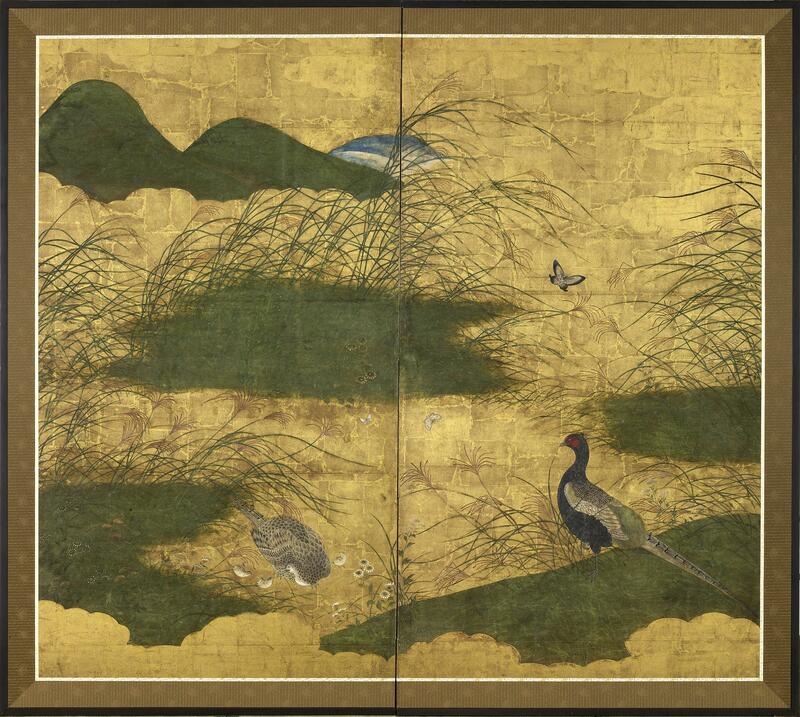 The pheasant appeared in Japan’s first poetry anthology, the Manyōshū (Collection of Ten Thousand Leaves) in the Nara period (645-781) and it remains to this day a poetic symbol of spring, when its distinctive mating call is heard. Chōchō are viewed by Chinese and Japanese alike as the souls of the living and the dead as well as symbols of joy and longevity. Introduced as a design motif by the Chinese, butterflies have also enjoyed widespread popularity in Japan since the Nara period. In Chinese mythology there is a story of an ancient Taoist philosopher who reportedly said on waking one day that he could not determine whether he had dreamt he was a butterfly or was a butterfly who had dreamt he was a man. Sanraku (Kanō) whole landscape painting of Musashino (plains) and pheasants. Two-fold screen. One of pair. Although this is a Kanō School screen, we do not believe it can be attributed with confidence to Kanō Sanraku. SKU: 6855. Categories: Screens, Two Fold.